Let's take it to the max today. No, not Saved by the Bell The Max, I'm talking maxi skirts. Flowing, breezy, easy for summer skirts. These skirts are statement makers but sometimes you just need a staple, a neutral, the black pant of maxi skirts. Oh and you need it on sale. 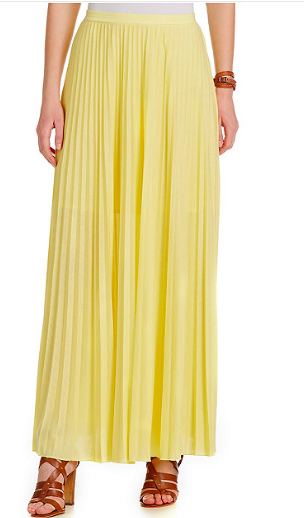 I give you the foundational maxi skirt under $50. This skirt is downright whimsical. I love the blush tone and the skirt is 60% off. 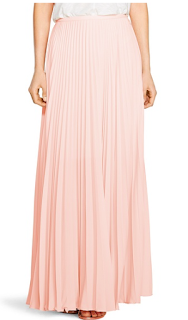 The seaming on this skirt gives it a sweeping effect. I love the amber color as well. I wish you didn't look at the price of this skirt. Doesn't this look black tie ready? You've GOT to see the pink version. A tall glass of lemonade anyone? This skirt is ready for espadrilles, flats, flip flops, or heels. 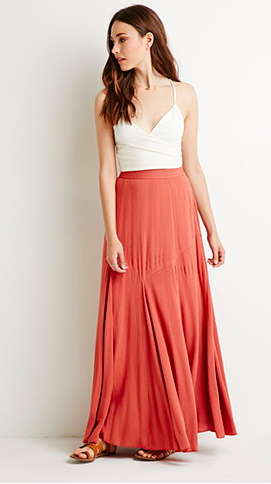 Maxi skirts are a great staple to add to your summer rotation. They are versatile with tees, blouses, button downs, and more.